Twin-Path Sparkeater Slings provide exceptional thermal stability and withstand temperatures up to 300F/149C. Fire exposure testing was performed by London Scientific, in conjunction with the Offshore Certification Bureau. 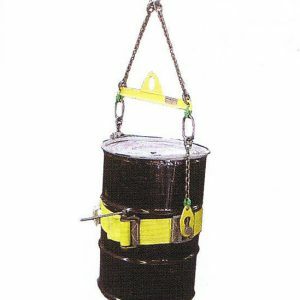 Sparkeater slings were identified as being, as good as, wire rope or chain for off-shore applications in the oil industry. Available in 10,000 to 90,000 lbs. vertical work loads. 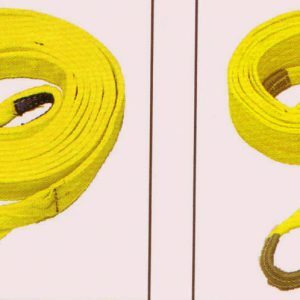 The aramid, load carrying fibers in Twin-Path Sparkeater Slings have high tenacity, low stretch and desirable, thermal properties. 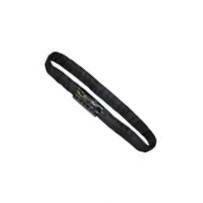 The protective, outer cover is constructed from Dupont Nomex, a temperature resistant, aramid fiber. The outer cover contrasts against the inner, red cover, providing an early warning alert. Sparkeater Slings feature the patented benefits of the Twin-Path sling design: two paths for back up, redundant, protection, two, contrasting covers and tattle tails, with the additional advantage of increased temperature tolerance. The Twin-Path Stage Rigging Sparkeater Sling is a perfect Slingmax solution for the inherent dangers posed by pyrotechnical displays. Stage Rigging Sparkeater Slings are furnished with a black, Nomex cover. 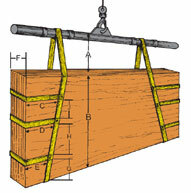 Flat-Pak Slings allow the sling user to maneuver and stack glass panels or wood crates in tight areas.